Celebrating art is a penchant for us at FanciFull so we jumped at the chance to sponsor The Spirit of Nature exhibition at Gallery 13 on Melrose Ave. The Summer solstice provided the theme while Fancifull provided the wine and cheese for an inspirational showing of fine Irish Artists. And celebrate we did. With Irish musicians, poets, dancers and singers providing entertainment while surrounded by inspirational paintings and sculptures - which included bronzes of humans and nature melding into one to abstract, seascapes to bright acrylics- you couldn't help but be swept up into the aesthetics of the event. We even had our subsidiary catering company, Mangia Mangia, headed by our able Dave Elliot lay out quite a spread for all to enjoy - especially those stuffed potatoes! We brought the new season in with style! 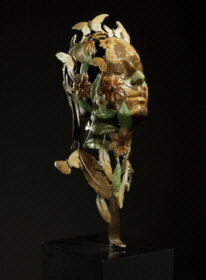 Gallery 13 is the product of artists Linda Brunker whose sculptures inspired by nature can take your breath away. Other artists featured in the Spirit of Nature Exhibition are: Paul Flynn, Gerard Cox, and Gregory Toal.